Prepare to be amazed by our carefully selected 3 best hostels in Lisbon. 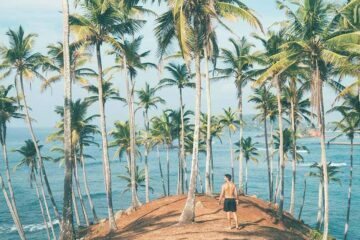 This is the full insider guide, sharing the coolest hostel in town, the party hostels and a few more travel gems. Are you ready for awesome design, fun events and a rooftop swimming pool? It’s all here! Lisbon is a vibrant city on the west coast of Portugal. 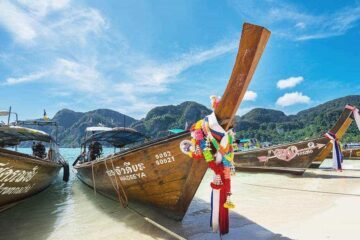 It’s a perfect location for digital nomads, solo travellers, party hostel lovers and backpackers. 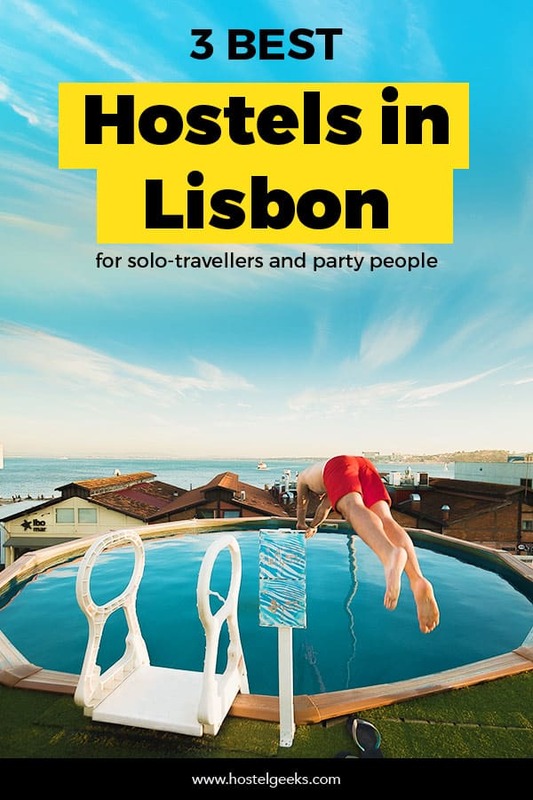 In fact, we’ll talk more about the best party hostels in Lisbon, plus the best hostel in Lisbon for solo travellers later in this guide. We condensed it all to the 3 coolest hostels in Lisbon. 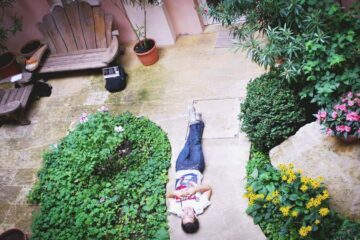 We, the Hostelgeeks, have 5 Star Hostels all across the world; including Lisbon. The only 5 Star Hostel in Lisbon is Sunset Destination. 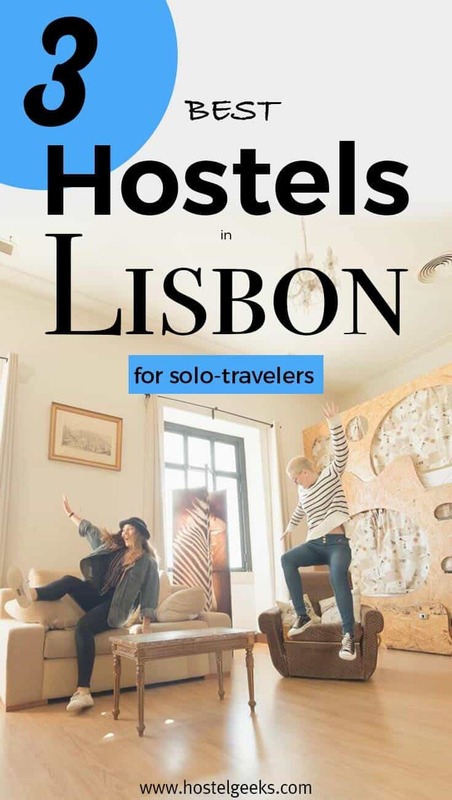 Although we give you already the #1 in town, it was time to give you a big guide to Lisbon hostels. There’s also The Passenger Hostel in Porto, and more 5 Star Hostels in Portugal. Lisbon is a city full of hostels of all types. 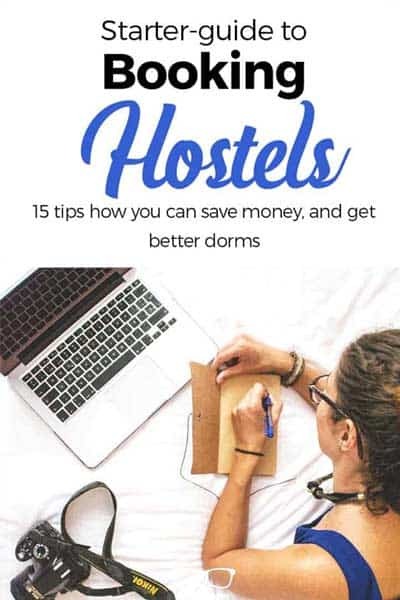 Actually, it has more than 160 hostels; at least! The quality is also very high in Lisbon and Portugal in general. It might feel overwhelming to decide where to stay. Worry not, we are here to make it really easy for you. Average price for a bed: A bed in a dorm can be as cheap as 13€. For a decent hostel, upgrade your budget up to 20€. 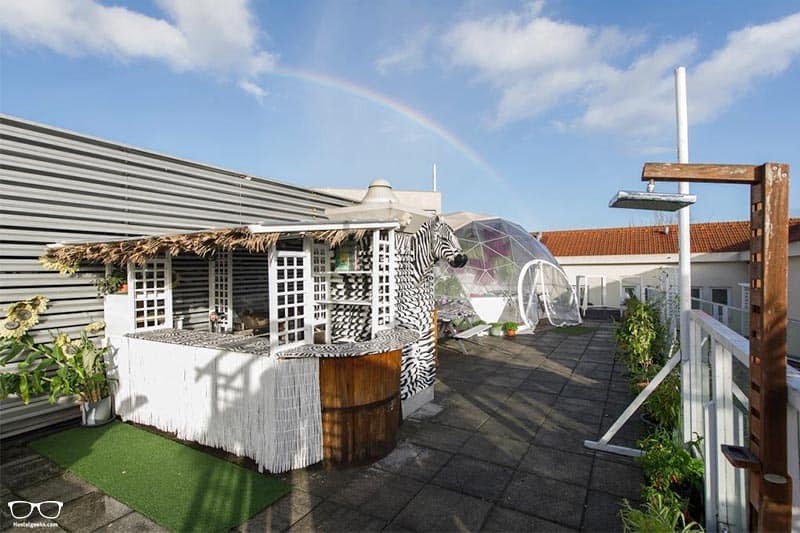 It will be worth it since you can upgrade to a gorgeous boutique hostel or a hostel with a roof top terrace or even a pool. The price per night is a rough average to give you an idea. Prices always depend on season and holidays. 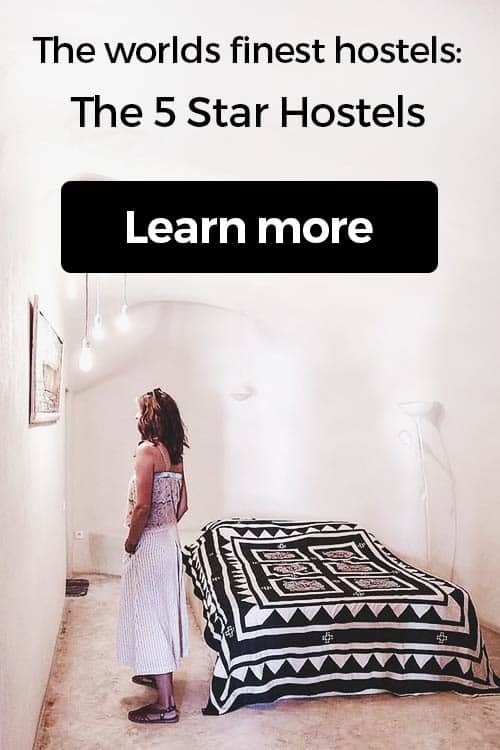 Always check exact rates on Hostelworld.com or Booking.com. Bear also in mind, in Lisbon is very normal that accommodations raise their prices on the weekends. 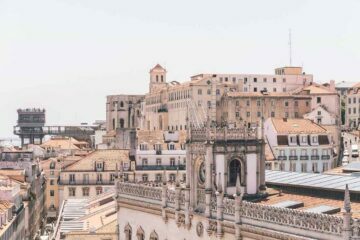 Best areas to stay in Lisbon: Regardless Lisbon is compact and relatively a small city, the neighborhoods are very diverse and distinct. Here we summarize you the most interesting districts for us in the city center and nearby area. You will find them marked on the map below. Lisbon Tourism Tax: Travellers in Lisbon pay €1 city tax per person per night. This tax is usually not included in the price. How long to visit Lisbon? You can see all of Lisbon’s highlights in 2-3 days. 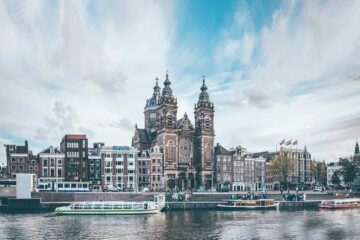 However, we do recommend you to spend some more days in this beautiful capital. 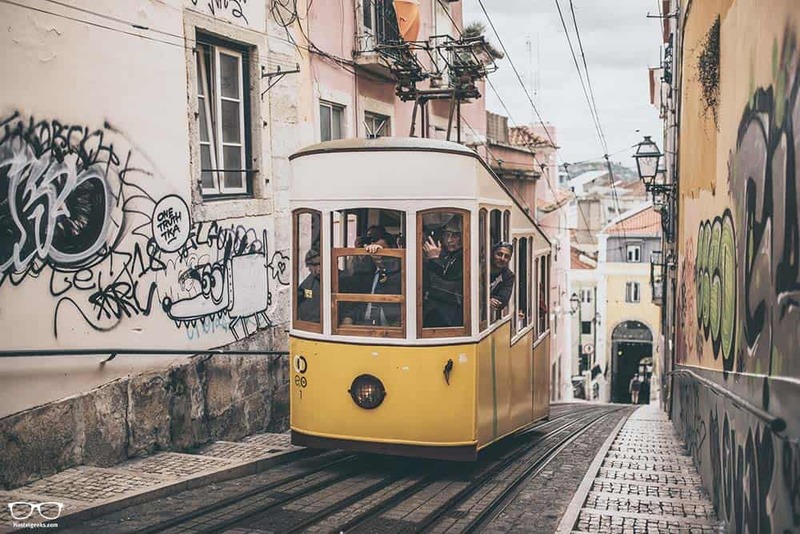 There are really good day trips which we are sure you will love to add to your Lisbon bucket list (find more information below). If you have a tight budget, you can always skip the day trips and spend the time at the beach, enjoying the colorful tiled buildings, tasting good food, sipping cheap wine, and enjoying Fado music around the streets. Even though Lisbon has nice weather all year round, we would recommend you to avoid summers and winters. Although winters in Lisbon are not too cold, it is the rainiest season. The perfect time to visit Lisbon is from March to early June or during September – October. The weather is warm, and you will find fewer tourists. Transport in Lisbon: Lisbon is quite a small, walk-able city, but it is hilly. That is why, public transport is a good idea. Public transport is very affordable. While buses, funiculars, and trams are maintained with the same company, the metro is managed completely separated. To avoid confusions, buy a Zapping card or Lisboa Card. Both allow access to all the transport systems. 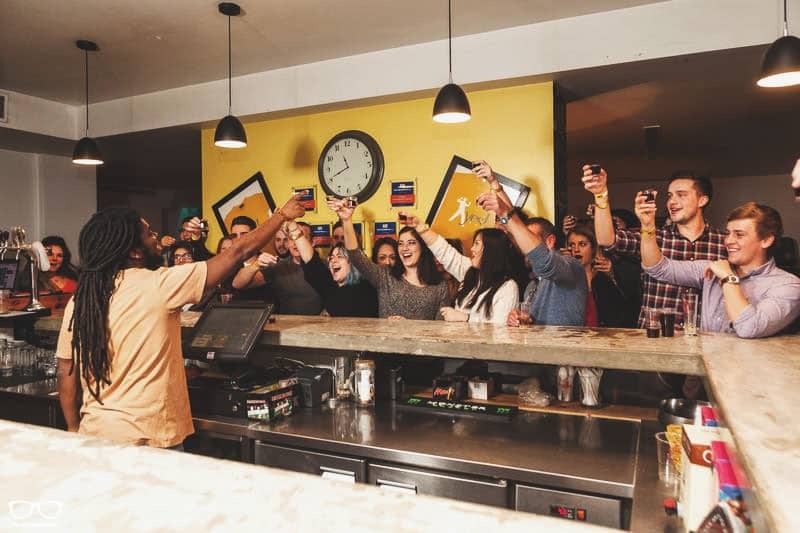 Without further ado, let us introduce the hostels to you! 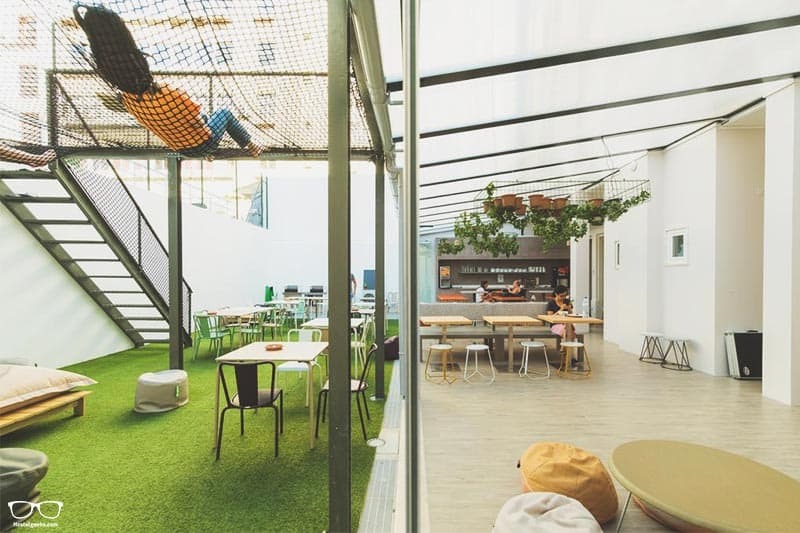 The Sunset Destination Hostel in Lisbon is an award-winning hostel. For one, we’ve given it a 5 Star Hostel rating! Here is our full review of Sunset Destination. It is famous for being one of the best hostels on this planet. Reasons are numerous. 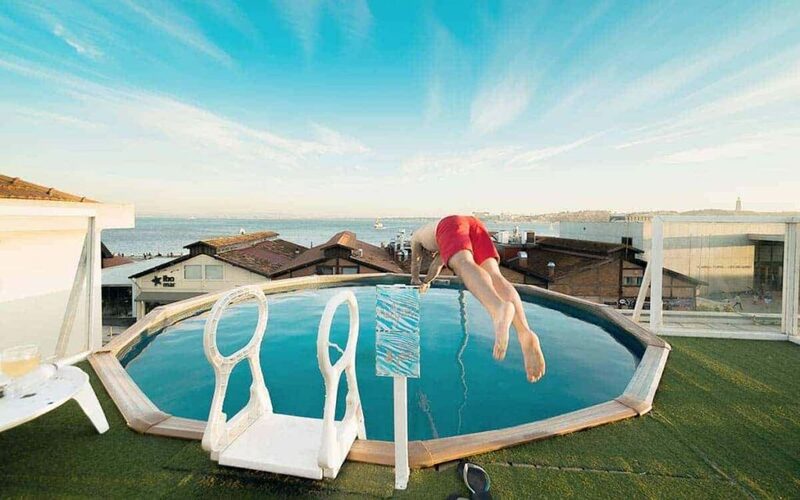 How often can you afford sunset views and a rooftop swimming pool on a budget? For starters, the rooms are beautifully designed and welcome all types of travellers. There’s a female-only dorm, family room, mixed dorms and private rooms available. 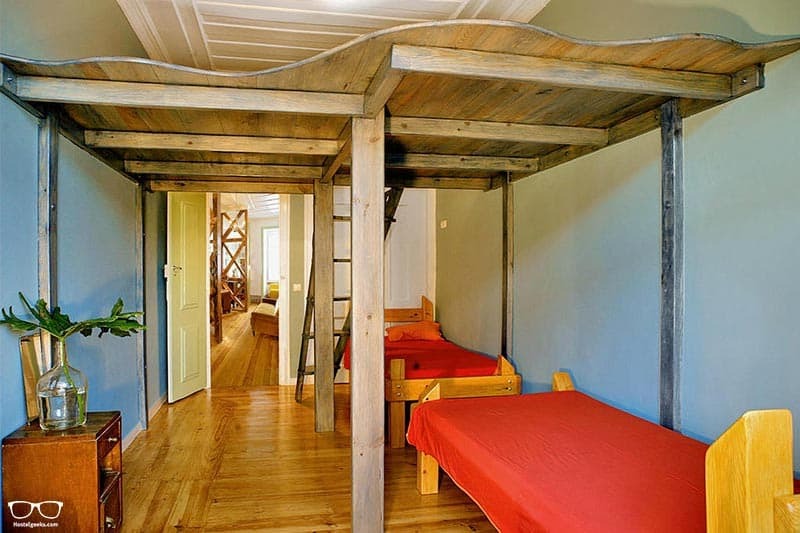 The bunk beds are really cool designed, inspired by a trip to Cappadocia, Turkey. They come with your own light, fan and sockets. It even has a small basket to put your little things. What facilities do they include? A luxury accommodation with budget prices. Not that you’ll want to spend much time in your room once you see the social spaces. Enjoy a swim anytime of the day overlooking the ocean and streets below. The Zebra Bar is also on the rooftop, so a refreshing drink is never far away. The groovy shared kitchen area is where you will enjoy a generous FREE breakfast every morning. And what a breakfast selection! Sandwiches, cereal, fruit, butter/cinnamon pancakes (our favorite),… plus freshly grounded coffee every morning. Every evening the chef rustles up a tasty dinner/BBQ which you’re welcome to join. Pay a small fee at the reception and reserve a spot. DJ nights are regularly arranged at the hostel and between 7-8pm it is free beer hour at the bar. Yes, FREE beer! The common areas are made to meet people easily. 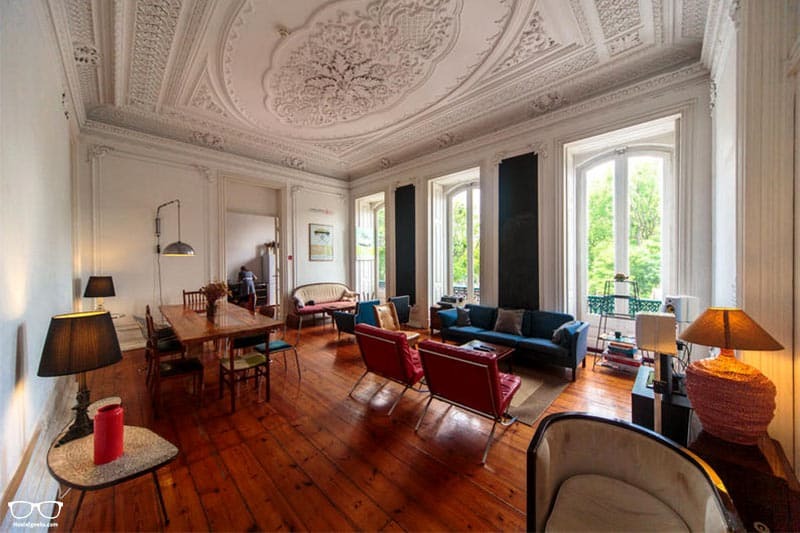 We know many travelers that preferred to stay in the hostel rather than go explore Lisbon. Be careful cause the place is just so enjoyable. Sunset Destination sits on top of the main train station in Lisbon. How handy is that? All major attractions are easily accessible from here. 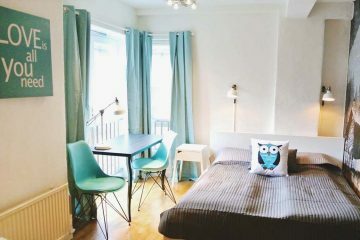 Besides being a central location, you can secure location for not missing your train or simply enjoy the real people watching TV, What hostels hotels or neighborhoods are best to stay at in Porto and Lisbon for good nightlife and this hostel is one of the best neighborhoods to stay at in Lisbon for good nightlife and food. Read our full review of Sunset Destination Hostel here. Good to know: All 5 Star Hostels offer the cheapest prices on their official website. Great tip to save some €! Hub Lisbon Patio Hostel is all about cool outdoor spaces, relaxed vibes and friendly staff. This newly remodeled building screams calm and collected, designed perfectly for those that wish to relax. There’s a range of mixed dorms and female-only that vary in size. Some even come with an en-suite. Twin and double private rooms also have the option of an en-suite for a few more coins. Remember to bring your own towel to avoid complimentary services (like towel rental). Here you have a direct link to our hostel packing list. Guests are welcome to cook their own meals in the full equipped kitchen, or head to the restaurant area just 10-minutes walk away. The shared dining area is spacious, and joins up with the on-site bar. It’s the outside lounge area that really makes this hostel great. Jump in one of the oversized hammocks, watch a movie or enjoy a game of pool. How could you possibly get bored? Make sure to fill up on the free breaky before you head out of the day. Located slap bang in the centre of the city, trains and metro stations are just 2-minutes away. 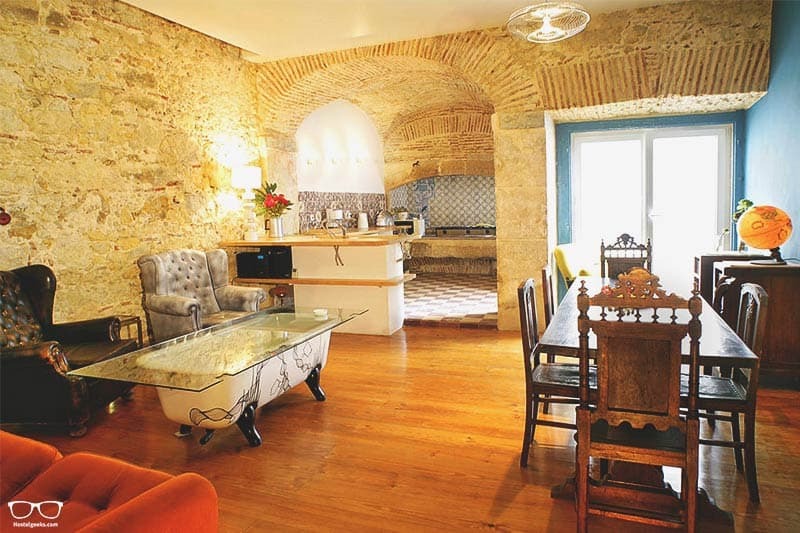 On offer a bit out of the heart of Old Lisbon is a 250 year old building housing the beautiful Lisbon Calling hostel. Have a quick look at the pictures to really get a feel for how cool the design is here. Expect to find raised sleeping platforms, warm colors and themed rooms. All of the dorms are mixed, each with a different theme. They certainly are quirky in style! Private rooms are lovely and big, with a shared bathroom. Lisbon Calling wanted to create a homely feeling, so bathrooms are shared for all. Don’t worry though, there are dedicated HIS and HER toilets and showers. The living room is representative of an typical homestead – cosy, colorful and calm. The common areas (living room and kitchen) creates the best vibe. It’s a space where you can just chill, cook nice meals or have dinner together with other guests. Sit at the long table and star making new friends! It’s the perfect place to chill and chat to your new family. The vibes at the hostel are great – super chill, friendly people. Definitely not a party hostel. And the staff is really helpful. Don’t be shy and ask them anything you want to know about Lisbon! The communal full equipped kitchen is attached to the living space, so why not cook together and enjoy a meal? 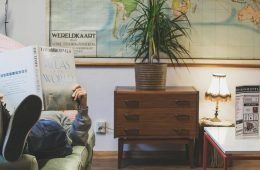 Good to know: this hostel doesn’t arrange any activities, perfect for anyone looking for downtime. If you are into social hostel events, go with the Sunset Destination. It is our #1 recommendation above. The hostel entrance might no be easy to find at first sight. It is located on an old building that looks like an apartment and there is no big sign with the name on it, so make sure you get the address marked on your map, ask them for the directions on an email (or simply open the map we created below). It is not in the city center, but it is located less than 10 minutes walking from Praca do commercio, around 5 minutes to the neighborhood Cais do Sodre (nightlife district) and near the metro to take you directly to the airport. 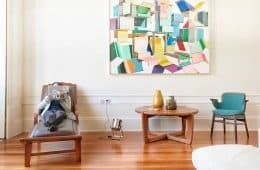 Best hostels in Lisbon for Solo Travellers? Well let us tell you we didn’t have much trouble finding suitable hostels in Lisbon for solo travellers. We think the best hostel in Lisbon for Solo-Travellers is the Sunset Destination Hostel! 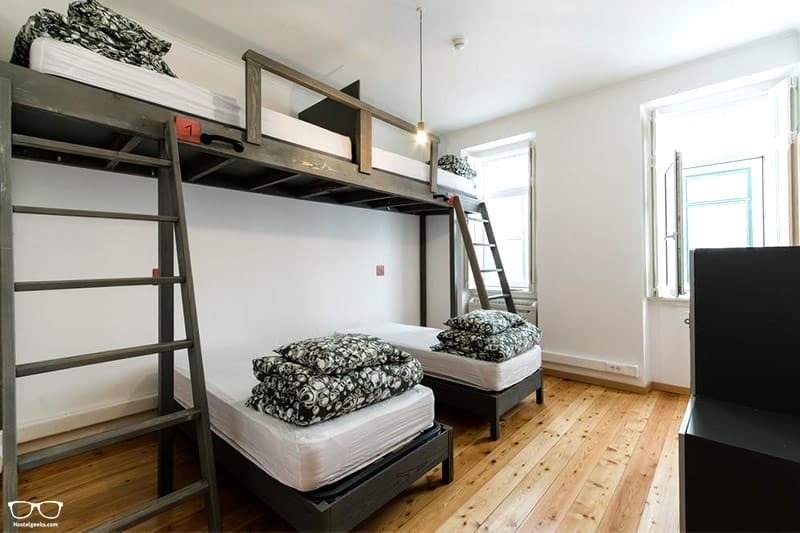 Here is two more hostels you will like when traveling on your own. First off, let us introduce to you The Independente Hostel & Suites. 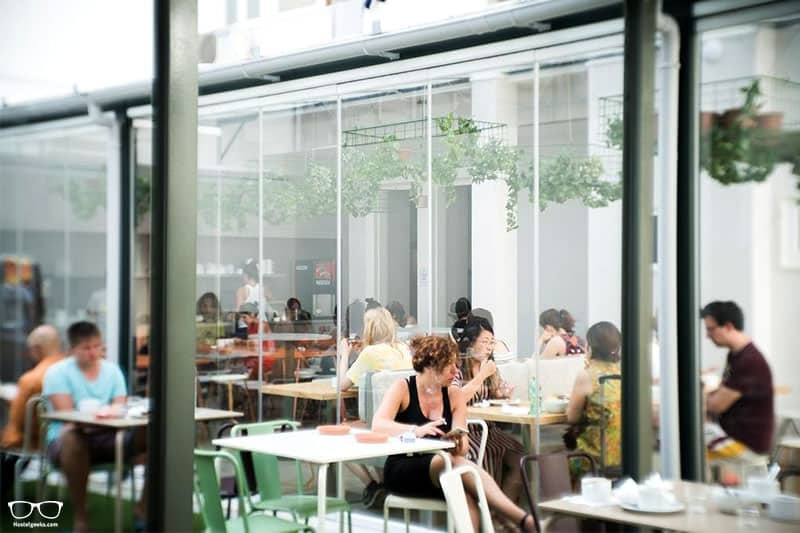 One of Lisbon’s most stylish hostels set in the liveliest neighborhood in the city. The shared dorms come in size small, medium and large; it depends how sociable you’re feeling. A bar, restaurant, exclusive guest lounge and garden are all part of the Independent experience. It’s a top choice for solo-travellers looking for a quiet, yet sociable stay. But perhaps you’re a solo traveller looking to start a party with your new found friends? In that case we recommend staying at Yes Lisbon Hostel. The lobby is where everyone hangs out. This is also where many special events take place. Join in on a free walking tour, famous dinner and an optional pub crawl. The rooms are quiet and there’ll be free coffee waiting for you throughout the day. You might already heard… Lisbon is well-known for its nightlife. The most famous neighborhood for partying is Bairro Alto. 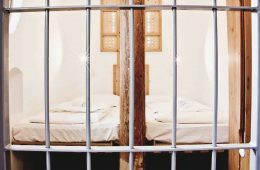 With hundred of bars and plenty of young people around, you will find some group to join. Bars close around 2 am on weeknights and a bit later on the weekend. Once the bar closes, the party moves on to the nightclubs, which stay open until late. Actually, most of them close after the sun comes up! It is exactly the same about the nightlife in Barcelona. In general, Lisbon is a safe city – although it is home to a lot of pickpockets. Again, same as Barcelona, Rome or Saint Petersburg in Russia. Drunken tourists make for a very easy target for them. Be sensible with your stuff when you’re out at night. There is no need to become paranoid. Just pay a bit of attention. Also, you can ask at the reception if there is any particular safety tips. 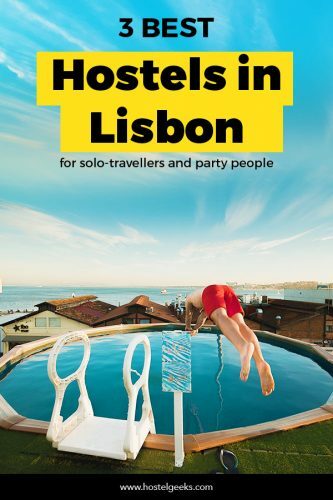 What about the best Party Hostels in Lisbon? 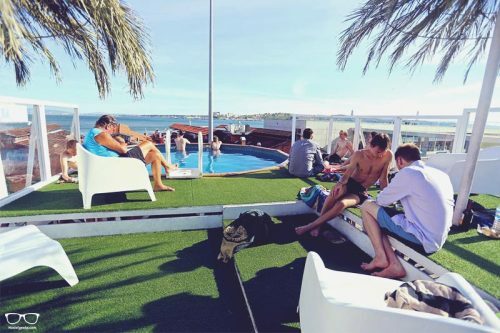 Is it too predictable to say our top recommendation for the best party hostel in Lisbon is Sunset Destination Hostel? If you can think of anything more needed for a fantastic party vibe, do let us know. There are so many reasons why we handpicked the 3 hostels above for an excellent hostel experience in Lisbon. Nevertheless, we know that if you are a spontaneous backpacker those hostels might be fully booked. We totally recommend you to book your hostel in Lisbon as soon as you know your dates. Of course Lisbon is packed of hostels, but the greatest get reserved fast. What about the cheapest hostels in Lisbon? There is much more hostels in Lisbon that we have covered here. As mentioned, there is more than 160 hostels in the city! We only want to share with you 3 handpicked places we recommend to 100%. We love to share the finest hostels. And we only share places we would recommend to our family and friends too. So, what about the cheapest hostels in Lisbon? These are easy to spot. We wrote up a big guide to things to do in Lisbon. 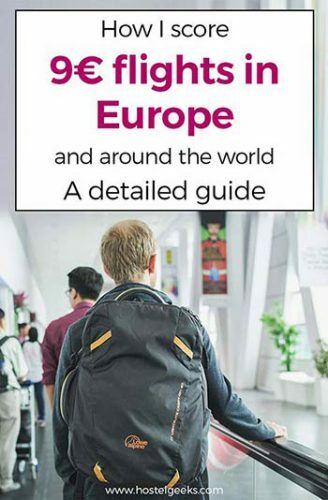 We wanted to create also a special guide. As it is not public, it is meant only for real travellers. You can download the guide for free below. Tip: A locals spot for lover of creativity. Meet artists, designers, and more along with many events! After spending a few days in this eclectic city, we have a few fun pointers to share. Actually, we have been to Lisbon several times. We learned from our first mistakes. Here we share them with you, so you can do better. One thing we wished we’d known is just how full restaurants get in the evening. A typically Portuguese thing, it seems, is small and popular restaurants. As cosy as this is, it’s a nightmare for spontaneous dining. Take our advice: ring and book your table in the morning before heading out and avoid being turned away when you’re hungry. You can ask your hostel to call the restaurant when worried about language barrier. Bear also in mind that many restaurants do a pause. They close around 2-3pm and don’t open up until around 8 pm. You won’t starve, as you can always get fast food (or other simple meals) available all day. This is surprisingly cheap. Buy a 24-hour ticket which covers trams, buses, metro and trains. If you’re in no rush and don’t mind lugging your bags; take the metro from central Lisbon to the airport. It’s reliable and a good way to avoid heavy traffic. The Portuguese pavements are something to be marveled at. They’re super reflective and super slippery. Expect to go blind after a few days if you don’t have sunglasses. Take your time going down the hills, especially after rain. If you forget your sunglasses, you can buy a nice pair of sunglasses downtown. Skip the main shopping street and head to the markets. Here you can score better deals. You will find all 3 spots on our map for your convenience. There are so many people that get confused when looking for information about Lisbon, as they find also Lisboa. Worry not, both are talking about the same place: Lisbon in Portugal. Or should we say, Lisboa, Portugal?! It is not a special district, neighborhood or even a village. Lisboa is the name in Portuguese, and also in Spanish (the neighborhood country). You might hear and read both names. Any Discounts for hostels in Lisbon? Currently, we have no special hostel discounts in Lisbon. We know, it’s a pity. We are always working on discounts for our readers. How about we let you know once we receive fresh discount codes? 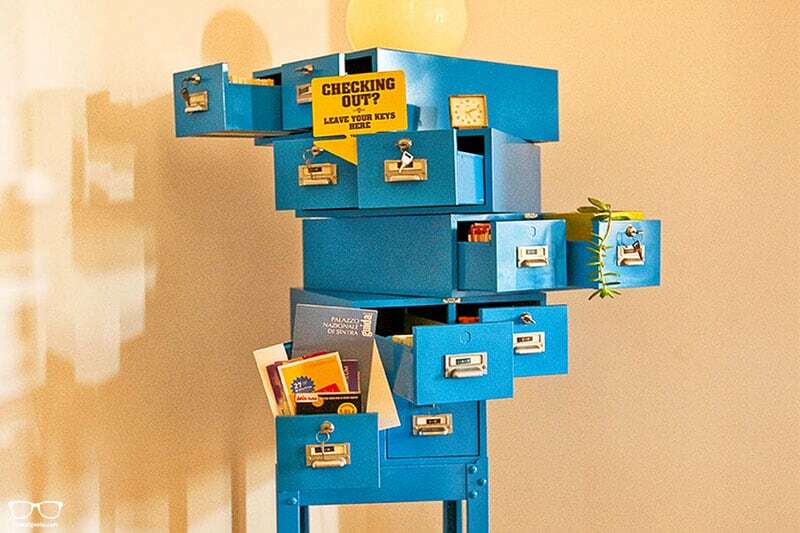 Subscribe to our newsletter to receive our newest hostel offers and tips always to your inbox. This map is designed specifically for you to make your Lisbon planning easier. All of the hostels mentioned above are pinpointed on the map. Top sights in the city are also pointed out. Looking for fun things to do off the beaten track? We’ve put together a guide to 29 fun things to do in Lisbon that you’ll love, it includes the best Lisbon experience! We spent time in Lisbon ourselves, so this guide has been created from our own impressions. Head to Arrabida for a Kayak Tour – we did this and it was awesome! To save time we suggest taking the Lisbon Sightseeing Hop on Hop off bus. To save money, consider buying a 24, 48 or 72-hour Lisbon Card. You can easily spend your entire trip in Lisbon and have an amazing time. Nevertheless, Lisbon has many beautiful places around which we are sure you will love to visit. The fairytale town of Sintra is one of the most popular day trips from Lisbon. 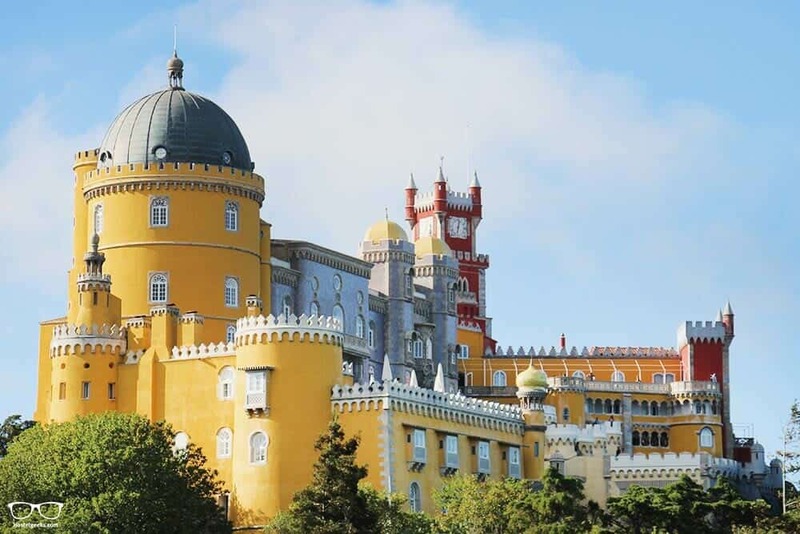 We are sure you already saw some Instagramy photos of the colorful Pena Palace. Pena Palace is perched atop the hill, and the gardens of Quinta da Regaleria are a mysterious place to explore. Sintra feels like a place full of magic and mystery, with< castles, palaces, and large estates hidden among the trees of this beautiful hillside town. The best part? It is just around a 40-minute train ride from Lisbon. Tip: if you want to avoid crowds, go early. Referred as the Portuguese Versailles, Palace of Queluz features designed gardens, waterfalls, grottos (caves) and a series of decorated canals. It is one of the finest Rococo palaces in Europe. Wanna visit the most westerly point in mainland Europe? Then head to Cabo da Roca. The steep cliffs jutting out of the ocean will give you the feeling to be at the end of the world. 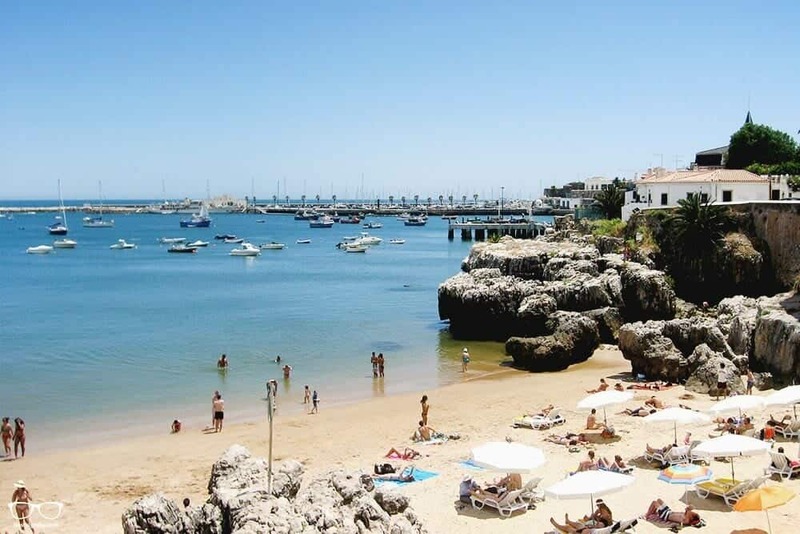 This area is easy to connect to both Sintra and Cascais by Bus. You can combine the visit with any of the 2 cities. Reachable by an easy 30-minute train ride, this traditional fishing town is a popular vacation destination for locals and visitors wanting to soak up some sun. 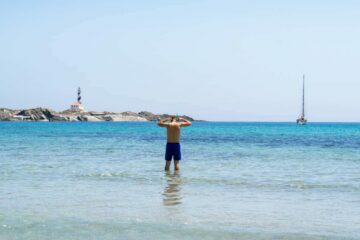 There are two nice beaches right in town. One of the most picturesque towns in Portugal. Obidos is a historic small walled town that was once owned by the Queen of Portugal. Flights to Lisbon are easy to find and quite affordable. It always depends on your departure airport. We paid 40€ for our flight to Lisbon from Barcelona, and once again 40€ fro London to Lisbon. The airport isn’t too far from the center. It’s possible to take the metro, bus or taxi which will take you between 30-40 minutes depending of which option you choose. 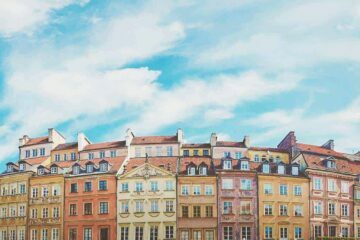 We enjoy Kiwi.com to find cheap flights all over Europe including Lisbon, Porto and Rome. Good to know: There is also a lot of cheap flights to Porto. Many travelers fly in to Porto, stay there for 2-3 days and then take the train to Lisbon. 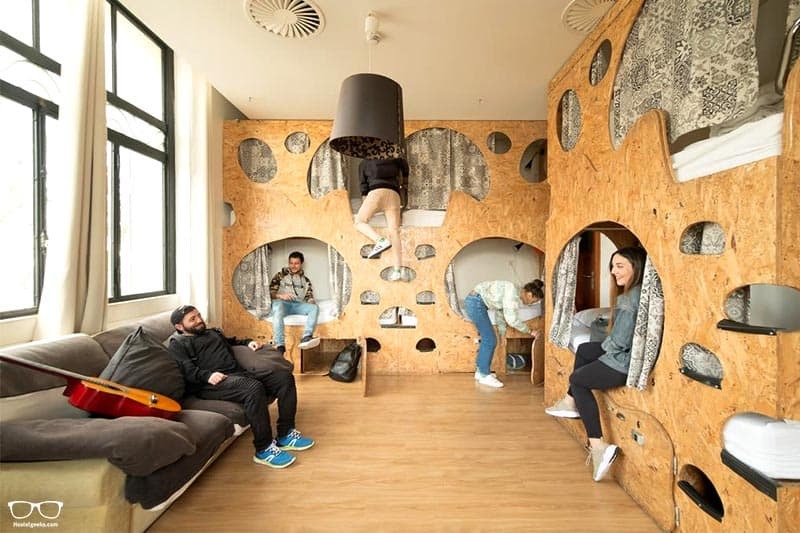 Right then, by now you have found your coolest fun hostel in Lisbon. The answer to the top hostels in Portugal is right here. By now I’m sure your hostel taste buds are positively tingling. It would be great to hear your thoughts on the 3 best hostels in Lisbon. 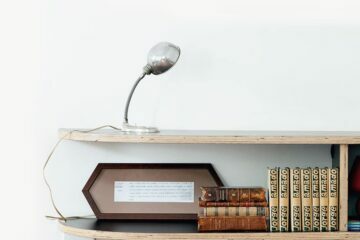 Perhaps you’ve already stayed in one of the best hostels in Lisbon for solo travellers. Have you already booked to stay in the best party hostel in Lisbon? Tell us all about it! Leave your comment below. Do you have any questions? Although this is a HUGE guide, and we hope no questions are left open, we are by no means perfect. If you have a question, please let us know and leave them in the comment section below. We would appreciate your question. It helps us to help you, other travelers and improve this guide. Oh and btw, if you are looking for us, we are most likely chilling at the pool. Hostelgeeks will never recommend you any place we haven’t evaluated or are not convinced by. Fairly, we only share with you places we also recommend to our best friends and family!